Answering atheist claims of the absence of God. So we should ask ourselves, is it still possible for such a complex being such as ourselves, to be a mere product of chance, or rather, are we products of a supreme and skilful creator, who has shown us that he really is al-Khaaliq? The concept of a Supreme Creator of the universe has been something, which the western world has been trying to prove or refute now for thousands of years. However, only in the past 200 years have the creme de la creme of western intellectuals, come to the conclusion that a God/Creator of the universe is and has been a figment of mans imagination. This conclusion was formed as a reaction to the beliefs and practices of Christianity, which was a major force in European life at this time. Beliefs such as that of the Trinity  and the divine nature of Jesus Christ, were so complicated to understand - even for the elite of the church - that eventually the idea of a supreme and perfect creator (which Christianity had distorted) was replaced by many new theories which tried to explain how mankind came about and developed. Many different theories were introduced to the western world, but one common trait, which they all shared, was that there was no Supreme force, which governed the universe. So where does Islam come into all of this? Islam  is the one way of life, the one religion which until now has not been challenged successfully by any philosopher, atheist or intellectual. Rather the case has been the exact opposite and there have been thousands, if not millions, of so-called 'atheists' who have reverted back to Islam. So how does Islam explain the existence of this Supreme Creator? This pure nature which every human is born with is known as the Fitrah in the Arabic language. Every human being, man or woman is born with this natural instinct to recognise the Creator and turn to Him. This is proven by the hadeeth of the last messenger to mankind Muhammed (peace be upon him) who said: "Every child is born upon the pure fitra, it is only his parents that later turn him into a Jew, a Christian, or a Magian." In fact if humans were not influenced by their societal pressures then their belief in the Creator would be distinct and clearly visible. But unfortunately this is not the case, and there exists in all non-Muslim societies a clear trend to distort the nature of human beings. One of the ways in which this is done in western societies is through the education system and its institutions. Western education is based around a whole body of secular thought which has no place for a Creator. In science lessons kids are taught that we are the ancestors of monkeys and apes and that this implies that we came about by pure chance. In subjects such as psychology and sociology we are taught that religion is a tool of the privileged few who oppress the downtrodden majority. This form of education has also unfortunately influenced the Muslims, and we find it very common nowadays to see the likes of the 'Abdullaah's' and the 'Fatima's' of western society proclaiming that they do not believe in God. SubhaanAllaah! (Exalted be Allah)[ 11] How beautiful and accurate this verse is. Is it not true that when we look at the world around us we see such beauty and craftsmanship. Surely such excellence could not have come about by chance. Everything in this world and universe runs on a set course and pattern, so how is it possible then, that by pure chance everything in this universe was created with such skill and precision? The wonders of nature are absolutely astounding, the wind, the rain, the hail and the snow were all products of chance, then why is it that mankind, with all his technological know how, cannot even divert the softest of breezes which blows through the trees in summer? The answer is obvious. All these natural elements are aspects of Allaah's Creation and he alone can control and manipulate them as he wills. 1 The belief that the Father (God), the son (Jesus) and the Holy spirit (?) are all parts of one God, despite the fact that they are 3 separate entities!! To this very day millions of Christians are still unable to understand this belief, which is one of the reasons why it has even been thrown out of some versions of the Bible. 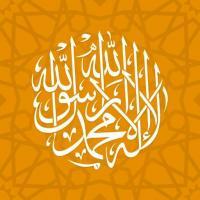 2 The meaning of Islam is to 'sincerely submit your will, to the will of Allaah (God)'. 5 Hadeeth: A report of the Prophet Muhammed's (s.a.w. 's) sayings, actions or approvals. 6 A Magian is another word for a fire worshipper. 8 This theory was made popular by a man known as Charles Darwin. 9 This is the view of the German scientist Karl Marx. 11 Glory be to Allaah who is free form any imperfection. 14 The supreme creator: This is one of the many attributes of Allaah.